The canvas measures 16” x 40”. Hang it flush on a wall or set it on an easel. The Welcome Message template is included with the instructions. When friends were planning their 50th wedding anniversary celebration I was more than eager to help out. The renewal of vows was planned outdoors by a reflecting pool in Arizona at twilight. The “bride” asked for turquoise, silver and southwest colors incorporated into the canvas along with a photo of the couple from 50 years ago. I was nervous about combining so many colors on one canvas but when I had the idea to place most of it on the branches, it all came together. The gradation of turquoise ends in a strong backdrop for the metallic silver mat around the photo. Although it doesn’t show well in these photos, look below and you’ll see the beautiful glittery silver branches that pulled together the entire concept. The lights are poked through the canvas and secured on the backside with a glue gun. If you know someone celebrating a special event indoors or out, a customized canvas makes a great gift. step 1 - Airbrush the canvas with turquoise paint. Begin with full color at the bottom and a progressively lighter spray working toward the top. Mix Mocha paint with white to create a light tan color. Spray full color at the top of the canvas then spray a lighter coat as you move down the canvas to blend into the turquoise. Protect the painted center when dry with Frog tape and airbrush all four sides with solid turquoise. step 2 - Working over a paper towel, use a wood pick to hold down each white petal while you airbrush them. 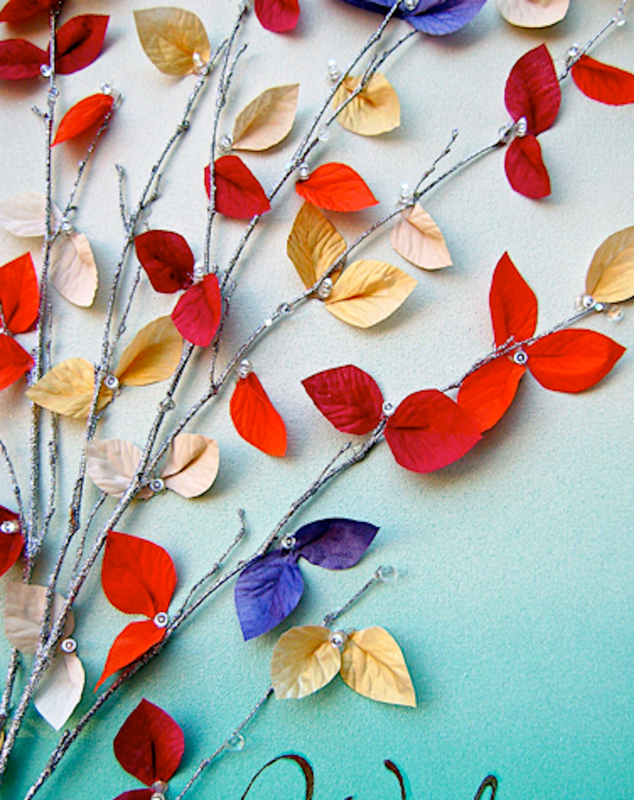 Paint approximately 80 petals using, red, orange, gold, purple and the tan color you created. 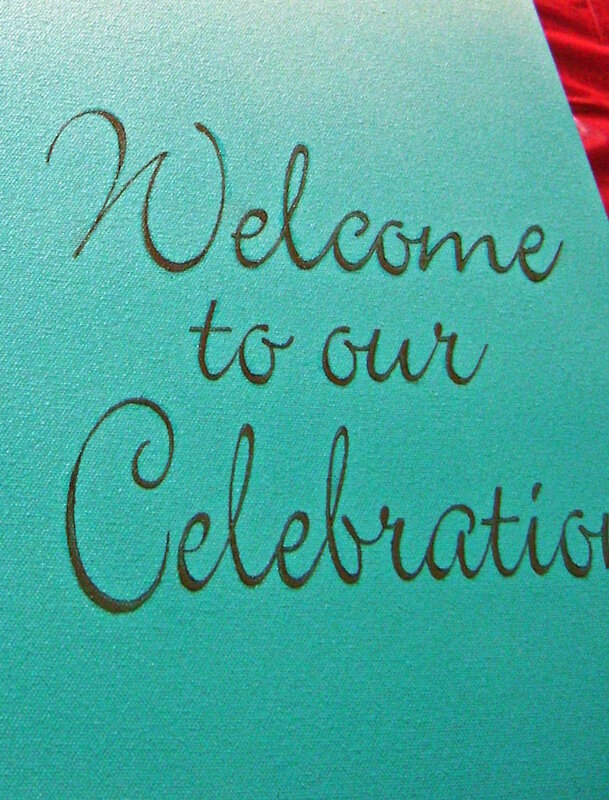 step 3 - I used a stencil cutting machine to cut out the welcome message on card stock and repositionable spray adhesive to attach it to the canvas. If you don’t have a machine and don’t want to cut the stencil by hand, print out the message and transfer the words to the canvas using tracing paper. Paint over the letters with mocha paint using a fine brush. step 4 - If you use the stencil, airbrush the message with full strength mocha paint. The message should be positioned about 20” from the top of the canvas and centered over the photo which will be placed below it. step 5 - The branches come 4 to a package and are 24 inches long. Some are fuller than others. Use the fullest branches on the upper canvas. step 6 - Arrange three of the branches so they sweep across the top of the canvas. Hot glue pieces in a curved shape as necessary. Position the fourth branch straight up the left side of the canvas starting at the bottom (see finished canvas). If the end of branch four doesn’t transition perfectly into the other three you can attach flowers to hide that. step 7 - Hot glue sections of the branches to secure them to the canvas. Attach 40 small pieces of painters or Frog tape along the branches arranging them so they’re distributed evenly. This is your guide for placing the lights. step 8 - One by one remove the pieces of tape replacing them with a hole. Use a sharp wood pick or other object to poke the hole. The object should be the size of the light or slightly smaller. After inserting the light, circle around it with hot glue to hold it in place. step 9 - When inserting the lights into the canvas, begin with the lower left corner. Work upward moving from left to right so that the wires won’t have to stretch to reach the next hole. step 10 - I wasn’t happy with the very round petals so I trimmed them to create a different shape. Make a small pleat with your fingers in the center of the petals to make them curve. Glue one or two pleated petals onto the canvas around each light. step 11 - Print the photo image on card stock. Spray the back with Super 77 adhesive and position it in the center of a 14” sheet of metallic silver paper. Spray the back of the silver paper with Super 77 and position it on the canvas. step 12 - Fill the battery pack then tuck it into the lower corner of the canvas’ wood frame. It should be recessed so it will not interfere if the canvas is hung flush to the wall. Hot glue it in place. Be sure the control switch is in a convenient position.